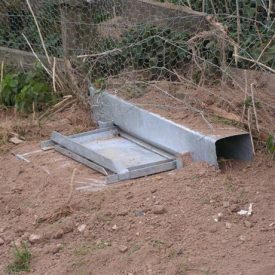 The rabbit drop boxes are dug into the ground alongside and used in conjunction with rabbit proof fencing. These traps are live catch so any none target species such as Polecats and Slow Worms can be released unharmed. The rabbits travel from their home through the tunnel of the box trap to their feeding grounds. 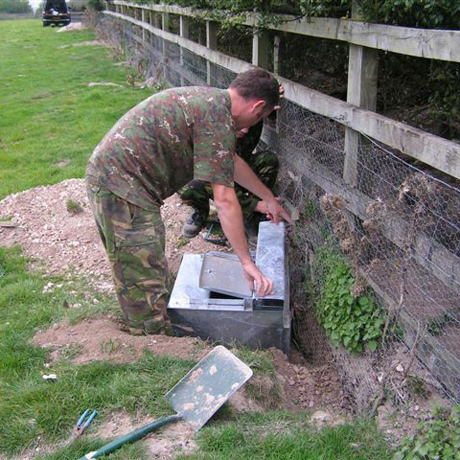 When set the rabbits fall via a trap door, unharmed into the holding area, where they are removed by our operator. 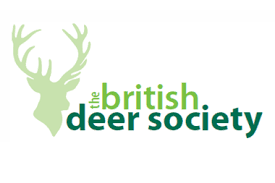 To avoid any tampering or miss use, all our traps are padlocked and can only be set and emptied by us or our client. The results of drop boxes are instantaneous and very visible. Often the customer inspects when we check the trap line and are normally amazed how many rabbits are caught in one night! 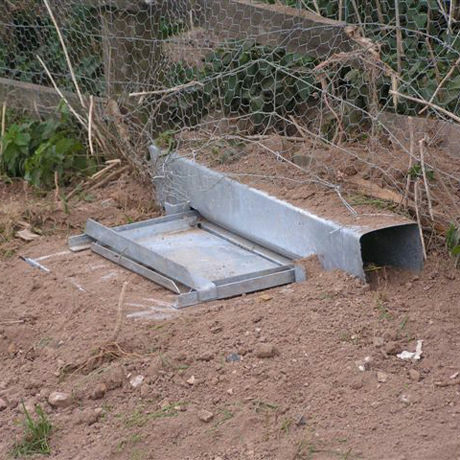 These traps are ideal to use when rabbits come from land you cannot have access to, such as from Railway and Motorway embankments. In addition their, covert underground presence makes them ideal for use in public and sensitive areas, such as on the boundaries of cricket pitches and public parks, where discretion is paramount. The boxes can be retro fitted to existing fence lines or freshly installed along with a new fence. By using these boxes a passive fence turns into one of the most lethal industrial rabbit management systems known to man. Not only do these boxes deal with the problems but they save valuable money already invested in the fence by substantially prolonging its life and use. Here at Landmark we hold a large stock of various types of drop boxes all galvanised to last and give many years service. 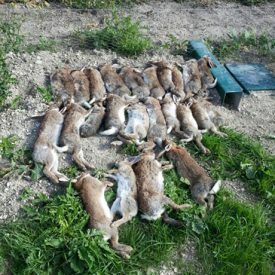 From small portable garden boxes to permanent heavy duty agricultural boxes capable of holding some 30 plus rabbits per session. Initially it may seem an expensive exercise to install the traps but over a few years the cost is very minimal, but the results are very great. To help we offer these traps on loan or sale and if required with bespoke financial payment packages and interest free. This includes supply, installation, regular maintenance and operating the boxes along with removal of the rabbits.